During the early 1950s, the well polished comic team of Dean Martin and Jerry Lewis broke box office records and created a worldwide following. After splitting up in 1956, both men found themselves in successful solo careers. In 1959, Paramount Studios contracted with Jerry Lewis to create 14 films in 7 years for $10 million plus a profit-sharing deal. 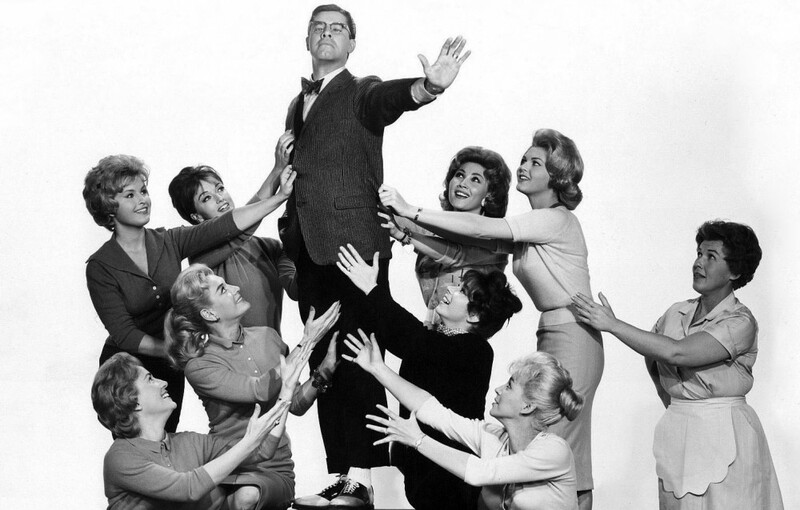 Released in 1961, The Ladies Man was written, produced, and directed by Jerry Lewis. The period from 1960-1964 would come to represent the best of Lewis’ creative output. The Ladies Man begins as Herbert H. Heebert (Lewis) graduates from Milltown Junior College with plans to marry his sweetheart. Those hopes are destroyed when he finds her romantically involved with a letterman. From here on, Herbert vows to remain a bachelor, “alone all his life.” Herbert quickly runs into his mother’s arms, in a surprise drag role also played by Lewis. Herbert begins looking for work and encounters job after job filled with beautiful women. After refusing their employ, he sees a sign in a window advertising “Young Bachelor Wanted.” Once inside, he meets Katie (Lewis’ post-Dean Martin straight man Kathleen Freeman), the house mother to 30 aspiring young actresses. Katie explains that Herbert’s job entails answering the phone, delivering mail, and typical household chores. He is then introduced to the owner of the boarding house, Miss Helen Wellonmellon, and is shown to his room. The next morning, we are introduced to the boarders through a routine of exercise, make-up, and getting dressed as the camera pulls back to show the other star of the film – the elaborate set. Reminiscent of the village built for Murnau’s Sunrise (1927), and later Tati’s Play Time (1967), the dollhouse-like boarding house was built on two sound stages, sat four stories high, and contained 42 rooms. 68 microphones and complete stage lighting were built into the ceiling throughout. The house took eight months to build at a cost of $975,000 and is wonderful example of what can be accomplished with complete directorial control of a film. The Ladies Man then settles nicely into a series of gags – simple and elaborate. Highlights include a scene with Lewis, Buddy Lester, and Lester’s hat where Lewis has a difficult time controlling his laughter, a scene with Kathleen Freeman force-feeding Lewis baby food, and a scene where Jerry unwittingly lets loose a collection of pinned butterflies. The Ladies Man was one of the first films to use the Video Assist system, pioneered by Jerry Lewis, in which filmed scenes could be viewed immediately after via videotape. A video camera was mounted alongside the film camera with both recording a scene at the same time. The video of the scene could then be instantly played back for review. Prior to this, a director would have to wait 24 hours for the film to develop before they could examine the scene. This process is now as much a part of filmmaking as makeup and sound. It should also be noted that Jerry Lewis helped to change the way films are recorded in Hollywood after bringing back a Nagra sound recording machine from Switzerland and incorporating it into his films – with The Ladies Man being the first. With this small 1 square foot device, audio could be directly recorded during filming. This machine replaced a semi-truck full of audio equipment which would have to be parked nearby, with a five person crew recording the magnetic track. The French director Jean-Luc Godard remarked about Jerry Lewis that “even his colors are funny.” Lewis’ style is easy to write off as buffoonery, but Jerry Lewis in his prime provided a marvelous combination of color, set design, and well-crafted jokes played off a naïf developed through years of vaudeville and nightclubs. Lewis’ comedic genius directly influenced such heavyweights as John Ritter and Adam Sandler. Even the comedian everyone loves to hate, Andrew Dice Clay, borrowed heavily from Lewis’ character Buddy Love in The Nutty Professor (1963). The colors in this film are oversaturated, boosted by Jerry Lewis during production. He believed that years later, after the color in other films had faded, his would remain vibrant.